Team Breakers, from left, Kalohe Danbara, Kayla Coscino, Coaches Scott Finn and Alisa Cairns, Jake Levine, and Kiko Nelsen. 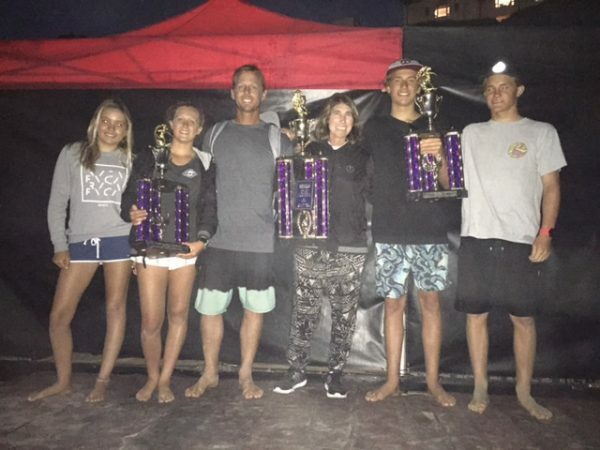 Laguna Beach High School’s surf team finished third out of 17 schools competing in the NSSA National High School Championships at Salt Creek Beach in Dana Point June 17-19. Leading the way were finalists Kayla Coscino, who took fifth in the girls shortboard, and Jake Levine, placing sixth in boys shortboard. Several years have elapsed since Laguna participated in this prestigious event and every member of the team succeeded in competing through the first round. In boys shortboard, Travis Booth pushed hard through several rounds with buzzer beater rides. He narrowly missed the final, taking ninth overall. Jake Levine rode his way to the final on a new board with a buzzer-beater ride of his own that scored an 8 out of 10. There were other great performances by quarter-finalist Kiko Nelsen as well as senior Dante Madrigal, who did double duty also competing in longboard. Senior Noah North also surfed well. Jeremy Shutts and Kalohe Danbara in the girls shortboard had some early solid performances that contributed to the team score. Jake Levine placed sixth in the national high school surf contest. Kayla Coscino, of Laguna Beach, rides to a fifth-place finish in the national high school surf championship.